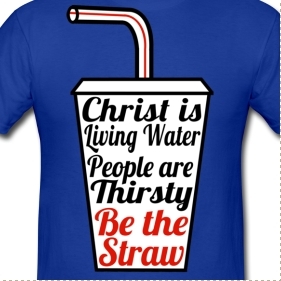 Be The Straw: We still have clothes! Check out some of our new stuff. We still have clothes! Check out some of our new stuff. Just because we have a new ministry and a brand-spanking new website, doesn't mean we're going to abandon what we started with. No, gentlemen and gentlewomen, we've got a new ministry, a new site, and the Be the Straw Store is still open, and we've got some new clothes! And besides, the New Evangelization will be more effective with the faithful's willingness to engage others in dialogue. When you engage others, you have to wear clothes, so you might as well dialogue by rocking our new Cup Motto Tee. And since it's soon to get a little cooler (I know, where did the summer go?) 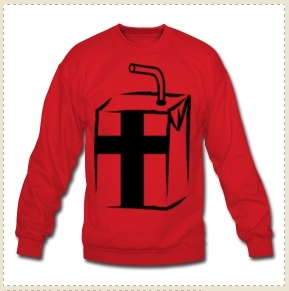 try sporting our new Juicebox Crewneck. When people ask you what your sweater means... BOOM! You've got them engaged in dialogue. Pope John Paul II would be proud. The last of our new designs is about love. Everyone loves love! But we're talking about that deep down Creator loves His creation kind of love. 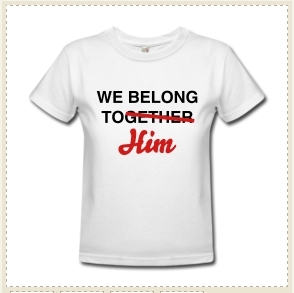 Perfect for the couple who have their eyes set on Christ (and likewise for the Christ-focused single folk) we have our new We Belong to Him shirts - and they even come in both Men style tees and Women style tees, in case you want to match with your sigfig.